The Finnweave and doubleweave samples are finished and I learned a lot. It’s fun to try a new technique, all the while thinking about how I will use it in future projects. The Finnweave sample is on the left above. 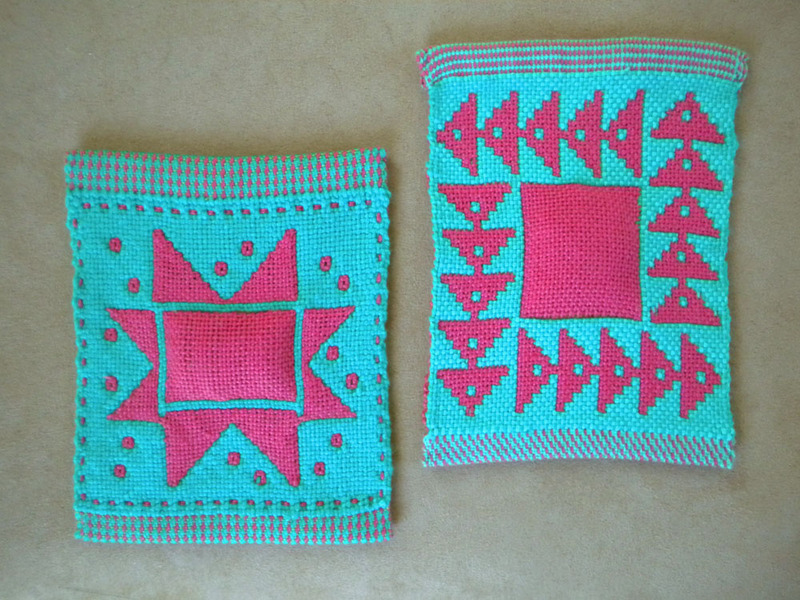 The sample on the right is doubleweave. As a comparison, the Finnweave is threaded two by two: two threads of background, two threads of pattern, etc. Doubleweave is threaded one by one: one thread background, one thread pattern and so on. When weaving Finnweave, you pick up your design and throw the shuttle twice before you have to pick up the next row. In doubleweave, you have to pick up each row. That is the main reason Finnweave is considered faster to weave than doubleweave. Also in Finnweave, the diagonal lines are smoother than in the doubleweave. That may make a difference if you want to weave something with lots of diagonals. And while Finnweave is technically not reversible, the back side is still pleasing and usable. Doubleweave is completely reversible. It took me a couple tries to figure out the Finnweave process. The green was my background color, pink the pattern color. So with every throw of the shuttle, I had to think about whether I needed the pattern to be horizontal (like the “stitching” along the bottom and top) or vertical (like the “stitching” along the sides). The pattern color is picked up on different rows depending on how it should look in the design. This slowed me down quite a bit and I had to unweave several mistakes. The doubleweave sample went much faster. Perhaps it was because I’ve woven loom-controlled doubleweave, where the layers are interchanged with the treadles rather than picked up manually. Perhaps it was because I didn’t have to think about the horizontal or vertical pitch of the pattern thread. Whatever the reason, I enjoyed the weaving and went on to weave two other small samples of old graphed designs. Now it is time to move on to other warps. But it will be interesting to plan how Finnweave and doubleweave will show up in projects to come. The crinkly cotton towels are off the loom and waiting to be hemmed. And they turned out very nice in spite of my earlier reservations. Once before, a long time ago, I had mixed some strands of this yarn with other cottons in a towel and was dismayed when it shrank at a different rate than the rest. In other words, I had a seersucker towel–not what I had in mind! So the yarn sat for a very long time; I was avoiding it. That, and I didn’t know if the darker shades were colorfast. But this time, I did not mix it with anything else, and I washed it in hot water with a color fixative, followed by a regular wash. The result was normal shrinkage and no color bleeding; very good. Weaving can be an adventure and an experiment. The heavy cotton/acrylic is still waiting to be warped, but it will be used this year. It is a promise to myself. And then there’s the Finnweave. I’ve been looking up information on it so I can use the small balls of perle cotton left to me by another weaver. She used it for Finnweave, but I have never tried that structure. According to Alison Irwin in a January/February 1999 Handwoven issue, “Finnweave is a variation of doubleweave pick-up…” She writes about both doubleweave pick-up (p. 36-39) and Finnweave (p. 40-43). Say you want a cloth with two different faces, dark on the back and light on the front, and designs that alternate those colors. In doubleweave pick-up, you manually pick up and alternate the dark and light threads to make the pattern. You can do larger areas with loom-controlled doubleweave, but with pick-up, you can be creative and do things like sign your name and “draw” free hand. Draw your design on graph paper and follow row by row in changing the light and dark threads. Finnweave exchanges pairs of threads rather than single threads, so it weaves faster. You can pick up your pattern, weave two rows, then change the pattern, whereas with doubleweave, you have to pick up a new pattern after every row. Doubleweave is reversible; Finnweave is not, according to the articles. But Finnweave allows you to weave diagonal lines, whereas in doubleweave, those diagonals appear in stair steps. This is intriguing and I will have to try samplers in both structures.